As the game between the New England Patriots and Los Angeles Rams kicked off, many of the hundreds of millions of viewers around the world were dialed in for football. Many other viewers were anticipating the commercials more. While lackluster action on the field may have put a damper on your Super Bowl party, perhaps it was those commercials that could be the saving grace. This is the biggest advertising day of the year each and every year because it's the most watched event in the world, each and every year. CBS is aware, charging more than $5 million for 30-seconds of air time. Does all of that ad spending add up to ROI? That remains to be seen. But what we can know immediately? The global audience reaction to the ads. What did people think and feel about the commercials? Was the overall sentiment toward the ad positive or negative? Did they love what the brands did? Do they feel more inclined to buy from them? Did they laugh? Did they cry? Were they angry or frustrated? Will they boycott? We can have these answers and we can have them now (the morning after the big game, when this article was published). 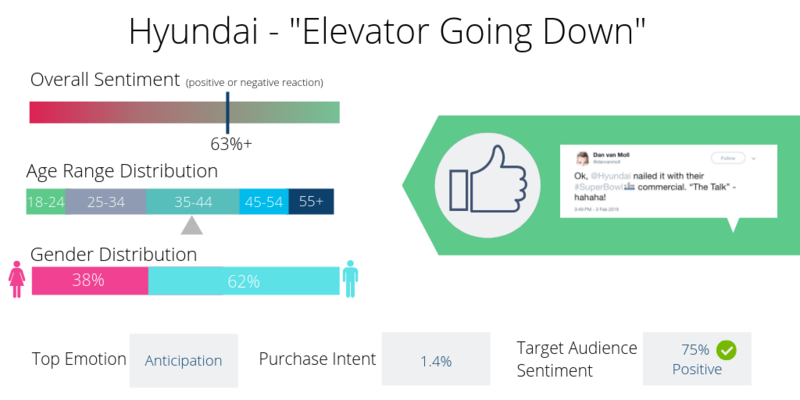 If you’re lucky enough to have smart tool, like the social listening tool Infegy Atlas, you don’t have to wait around for survey results, case studies, focus groups etc. You can use game-changing technology to research the global reaction to the ads (in real time, if you’d like). We chose a selection of buzz-worthy commercials, gave them a pass-fail grade **according to the audiences around the world** then used our social listening tool to measure sentiment analysis (positive or negative reaction), the top audience demographics, emotions and themes for each commercial. 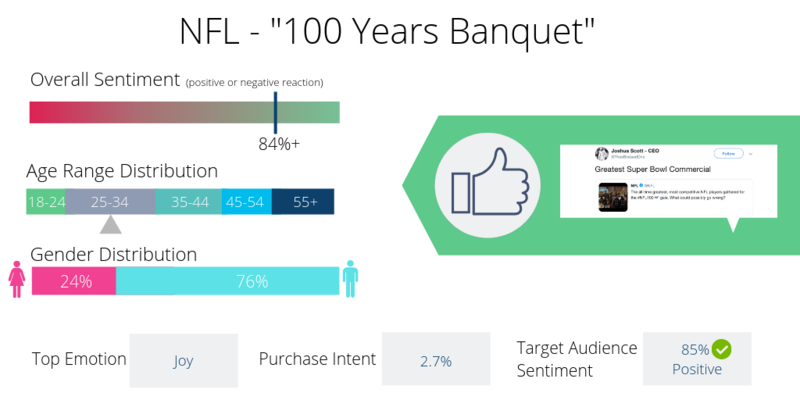 This is the true reaction to Super Bowl commercials, based in an incredibly accurate, a.i.-driven analysis, to help you get into the minds of the consumers about how they think and feel about the ads. 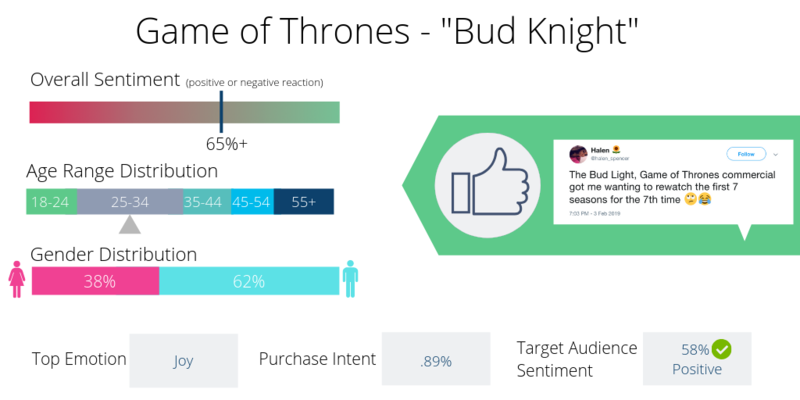 Game of Thrones crossover with Bud Light's "Bud Knight"
Regardless of what you think about Bud Light's quarrel with the National Corn Growers Association, you can argue that the beer brand won the night simply by getting the most conversation out of the night of advertising. Jason Bateman starred in a funny tongue-in-cheek play about the negative experiences in life. Two people enter an elevator and tell the operator, Bateman, they're car shopping. "Going down. Way down," he replies, taking them to different levels of the worst activities, from root canals, to jury duty, to "the talk." 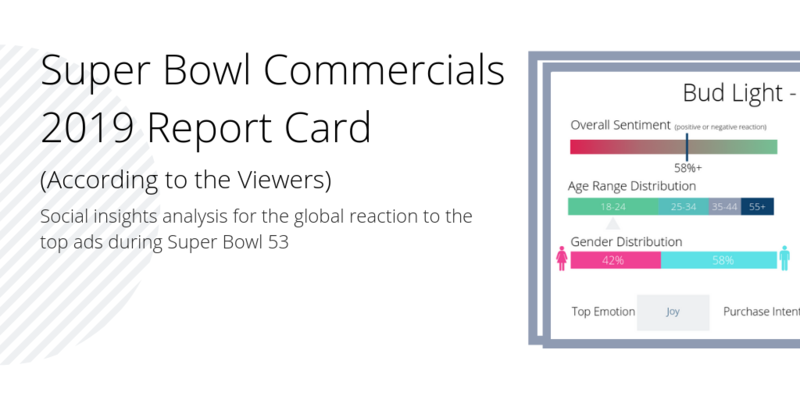 Most audiences thought it was a winner, with a 75% positive sentiment within the top age segment, 35-44. Bumble put the ball back in women's court. 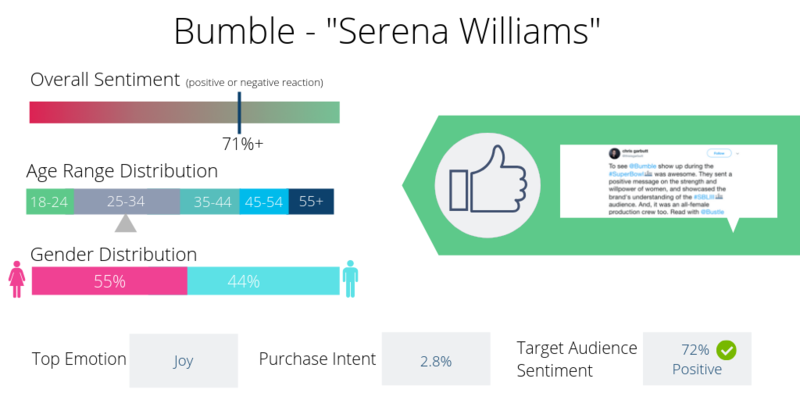 The ad by Infegy partner VMLY&R features tennis star Serena Williams "slaying it" in life and on a colorful tennis court. Most audiences responded well to the ad, as well as the messaging behind it. The savory snack stack made its second consecutive appearance on Super Sunday, after debuting a mildly amusing and harmless spot featuring comedic actor Bill Hader last year. They must have seen good results. How'd they stacked up in 2019 compared to year prior? Not as positive. This one featured two dudes talking about their flavored chip stacks and then the voice assistant expressing how it will never get to taste the Pringles. The NFL won 2018 with their play on Dirty Dancing starring Odell Beckham Jr. This year's ad (by the league's new ad agency partner, 72 and Sunny) practically stole the night. Hilarity broke out as the star-studded hall-of-fame group of current and former players fumble the football ornament atop the cake honoring the league's 100th anniversary. The nearly two minutes of hi-jinx was one of the best Super Bowl commercials of the night. Christina Applegate becomes frustrated at bickering M&M's in the backseat. Yelling ensues. The clever ad sparked a lot of joy from audiences and a 57% positive reaction. Michelob went full niche with their weird ASMR-themed spot. Some people really enjoy the strange effect of the whispering and ultra-amplified sounds. Others don't. But the concept wasn't lost on most and that made it either funny or relaxing. Either way, a positive reaction from fans. The twist ending to Bud Light's Bud Knight being embarrassingly defeated in a joust? Game of Thrones invaded the beer brand's commercial to advertise its final season premiering this year. If people weren't already amped up for the show, they were excited to see a shake up on an advertisement. It's not everyday you see two unrelated brands partner like this. FURTHER READING: How did audiences receive HBO's hit series Westworld? Find out in our 2018 TV Shows analysis here. 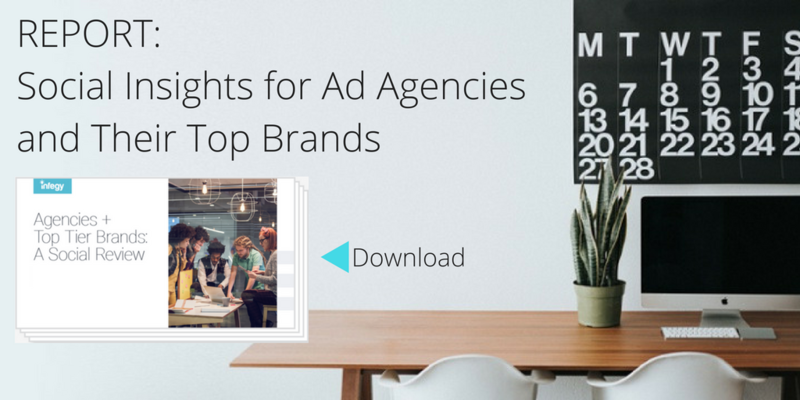 How did your brand's latest campaign fare? Find out by contacting us here.